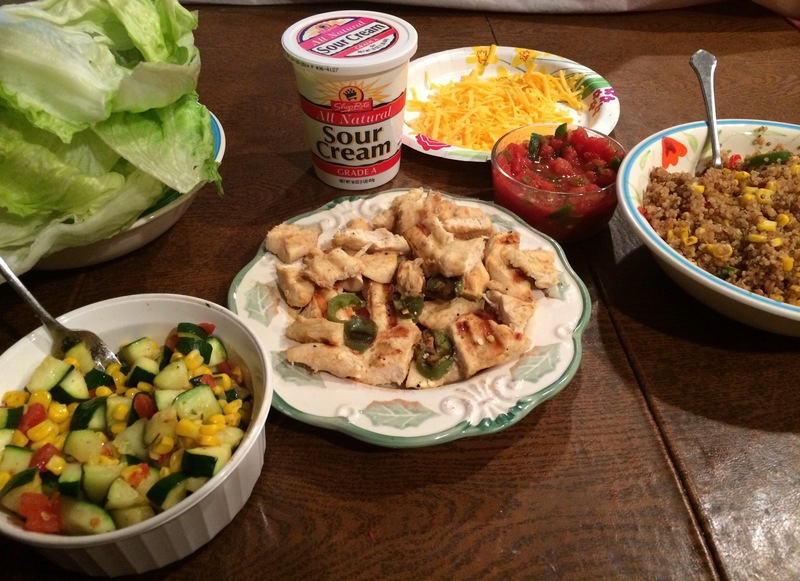 Being home for spring break and having what seems like an abundance of time and resources to concoct a culinary masterpiece, I combined three recipes I had been dying to try and held a healthy alternative to the classic taco night for my family! When you think of the classic taco, you think soft/hard corn or flour tortilla, some kind of protein (beef, chicken, or fish), some sort of salsa or pico de gallo, maybe some rice and/or beans, and cheese. All those wonderful ingredients evoke the flavors of comfort and excitement on your tongue. I LOVE TACOS, I love most Mexican food to be completely honest because most dishes give such a depth of flavor! 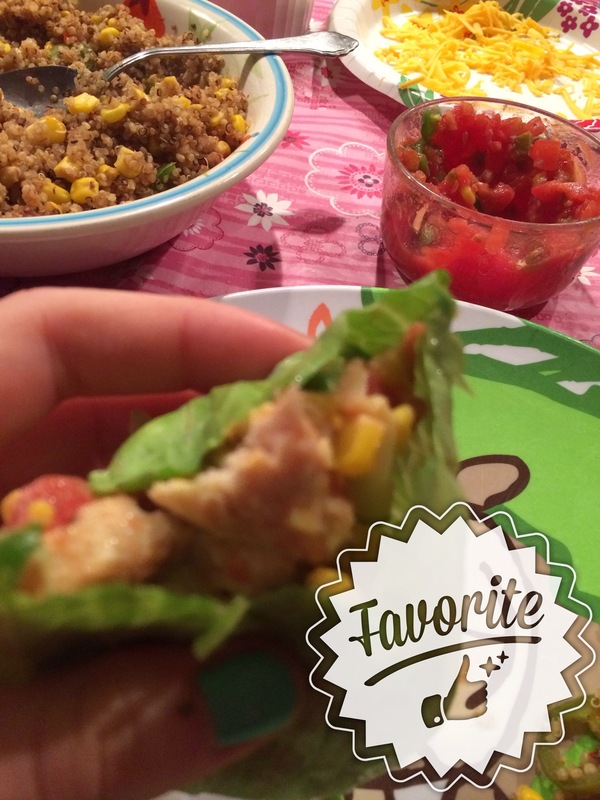 So I took those normal elements and found an alternative to make them a bit healthier by creating a lettuce wrapped taco stuffed with jalapeño-lime chicken, spicy quinoa with corn and peppers, and a zucchini, corn and tomato salad. 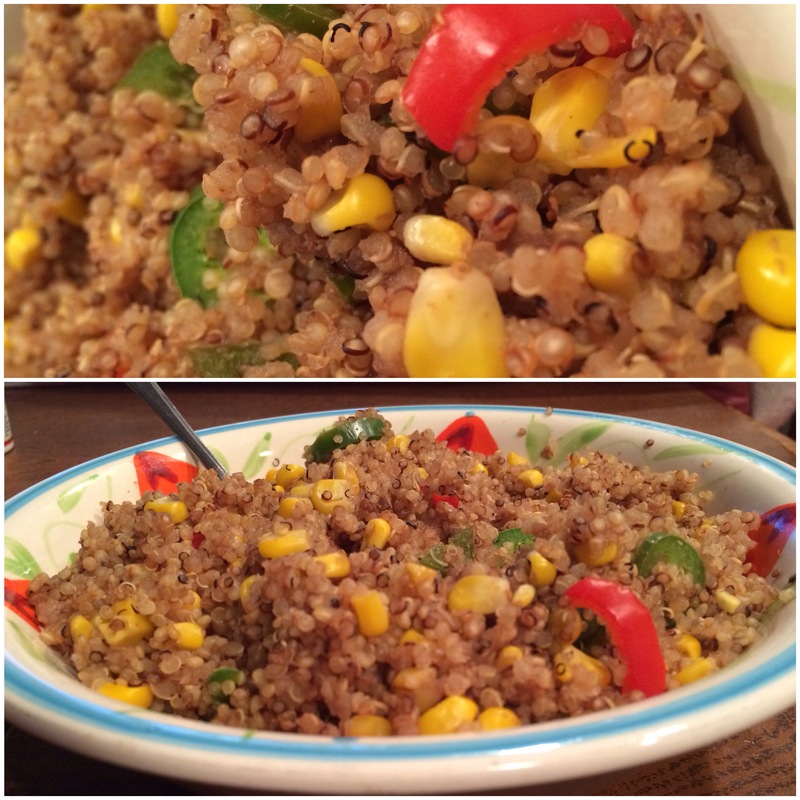 The quinoa I made was based off of THIS RECIPE, with some added changes to make it my own! The quinoa was a nice spicy addition to the tacos. It could be used as a side dish or inside the taco (I did both). Along with the jalapeños the recipe states, I also added some red bell peppers for a more mild flavor. In the taco, it acted as beans and rice as quinoa adds a starchy element and the corn and peppers add a little bursts of flavor and freshness. Adding the cocoa to the quinoa really gave it that mole kind of flavor, really adding to the Mexican flare. Hint: Quinoa is a pretty bland grain and so much flavor can be added and changed to make quinoa go with any type of dish you are making! 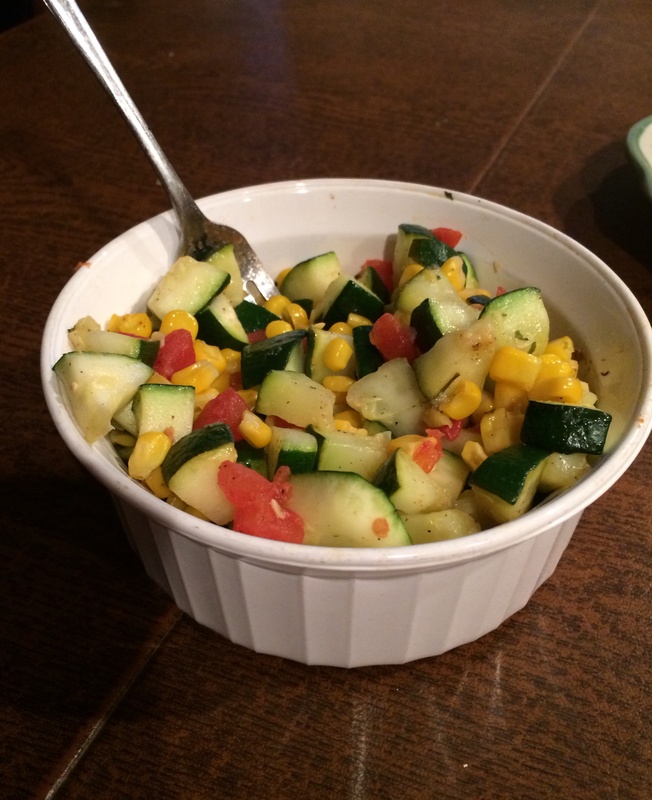 The zucchini and corn salad is based off THIS RECIPE. This salad is great because it is so versatile! It can be served hot or cold and can be used in the taco or as a side dish! With only 62 calories a serving, this salad is a fresh and delicious way to lighten up a taco! I also added diced tomatoes to my own salad to add more a different note of flavor to the salad. 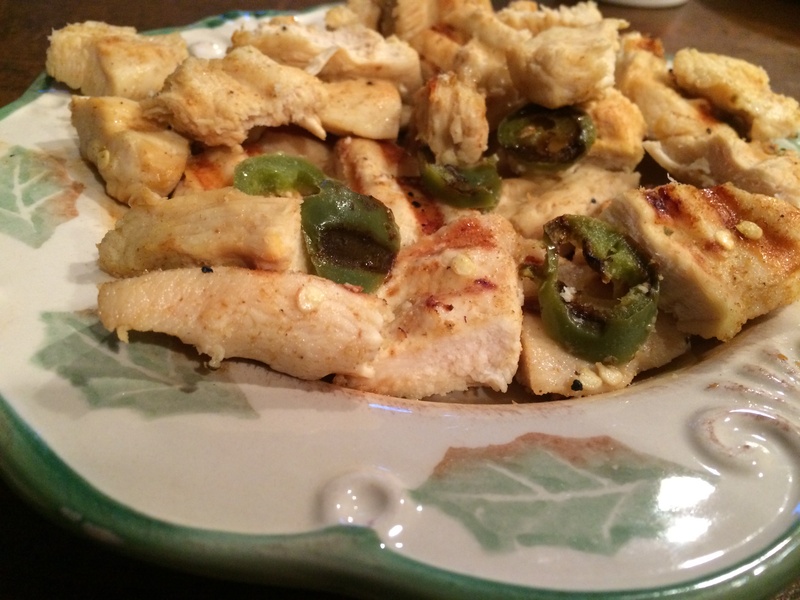 For the jalapeño-lime chicken I followed THIS RECIPE precisely. This chicken’s lime and jalapeño flavor went incredibly well with the similar flavors of the other ingredients incorporated into this taco. Tip: Let the chicken marinate for around 24 hours. I only let mine marinate for about 2 hours, and it definitely would have had a lot more flavor if I would have let it marinate for a longer amount of time. So after all the elements were made, it was now time to assemble this healthy alternative to your normal taco! First you need to have your lettuce wraps washed and ready to be stuffed (I used iceberg lettuce, but romaine would work as well!). The light flavor of the lettuce really lets you taste all the different flavors of the various elements of the taco and it also adds another element of crunch! Then add a layer of your quinoa, followed by a few pieces of chicken ( I found that 3 medium pieces worked the best for me), then add a little of the zucchini salad, followed by as much salsas and cheese you desire! ENJOY! AND MAKE A COUPLE MORE WITHOUT FEELING GUILTY! I made this meal for my parents when I was home for spring break and it was a hit! My parents are pretty health conscious and really think about everything that goes into their bodies (for the most part). They also LOVE spicy food, so I was inspired by them to create this meal! The prep time of the entire meal really didn’t take too long and because the meal has individual elements that can stand on their own, there is a lot room to change it up and make it your own or simply make one of the elements of the taco a solo meal!